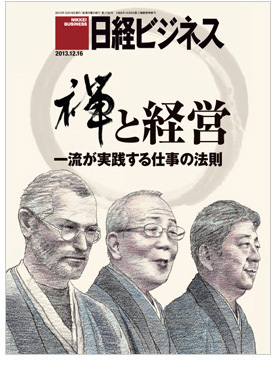 "Students of the Way should be thoroughly poor"
Here's an image of Steve Jobs, Kazuo Inamori, Shinzo Abe, from the latest Nikkei Business (one of the most popular business journal in Japan). The word "POOR" is written with Kanji as "貧" in ZUIMONKI. Why is "The way of Samurai" found in Death? Students of the Way should be thoroughly poor. These days the decay of the buddha-dharma is occurring right before our eyes. From the time I first entered Kenninji Monastery(*1), over a period of seven or eight years I saw many changes gradually taking place. They had built storerooms in each temple building, each person having his own utensils. Many became fond of fine clothing, stored up personal possessions, and indulged in idle talk. No one cared about the forms of greeting one another nor about prostrating before the Buddha. Looking at these things, I can imagine what other places must be like. A person of the buddha-dharma should not possess any treasure or property other than robes and a bowl. What is the need for a closet? You should not own things which have to be hidden from others. You try to hide things because you are afraid of thieves; if you abandon them you will be that much more at ease. When you don't want to be killed even though you have to kill, your body suffers and your mind is anxious. However, if you make up your mind not to retaliate, even if someone tries to kill you, you will not need to be careful or worry about thieves. You will never fail to be at ease. (*1)Dogen began to practice with Myozen at Kennin-ji, in 1217, when he was eighteen years old. He stayed there until he went to China in 1223. After he came back from China he stayed at Kennin-ji again for a few years.